When it comes time to replace your roofing system, you may be overwhelmed by the different details that make up a roof. Looking at your roof and the roofs of your neighbors, small details can really make a difference in how your roof function. One of these details involves the valleys of your roof. Valleys are created where two roof slopes meet. This area handles a lot of water run-off. As water goes on the roof, it will drain toward the valley area and then channel towards the exterior of the roof. Because of the sheer amount of water being navigated through this section, your valleys need to be properly sealed. There are two methods for sealing valleys: Open valleys and closed valleys. Find out the differences before you talk to a roofing expert. Before you install a shingle roof, the contractor will install an underlayment over the entire roof deck. Part of the underlayment includes a self-adhering ice and water shield that a heavier gauge than the rest of the underlayment. The self-adhering section acts as the lining for the valley. 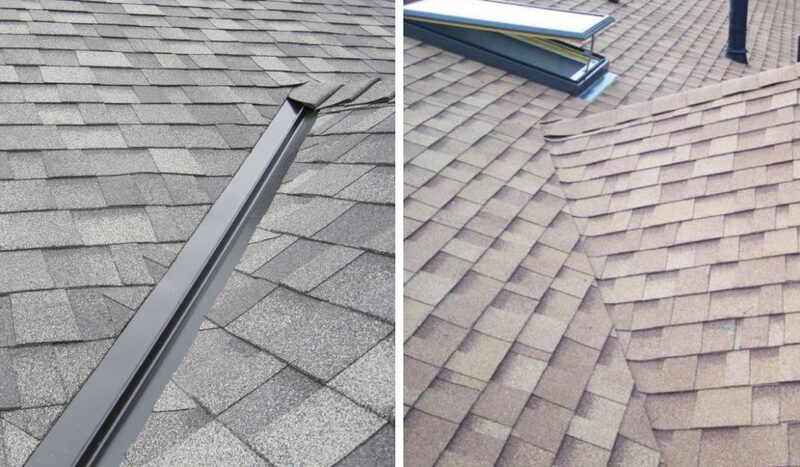 If you are installing a closed valley, the roofer will install shingles to the roof deck and extend the shingles through the valley so that it covers the entire valley area. When finished, the valley and its underlayment will be completely covered with asphalt shingles. The shingles act as the valley lining and protect the surface from water runoff. Closed Cut: Shingles are first installed on the side of the valley with a lower slope. Once, covered, the contractor moves to the side with a higher slope. Shingles are cut on the higher slope in a straight line through the valley. This allows water to fall from the higher slope to the lower slope and prevents it from going under the shingles to the roof deck. When compared to a closed valley, and open valley adds an additional layer of lining. After the underlayment is placed, a pre-bent metal valley lining is installed. This metal lining can be made of any type of metal that is resistant to the effects of weather, acid rain, or other contaminants. Then the second layer of underlayment is used to sandwich the metal on both sides. Like with the closed valley, when shingles are installed, they extend into the valley. However, they do not run through the complete valley area. A chalk line is used to strike a line from the bottom of the valley to the top. Then shingles are cut out of the valley area, which opens the surface for the metal lining to carry water off the roof. What Should You Consider When Choosing A Valley? There are several reasons why you would want to choose one over the other. When it comes to aesthetics, that is all up to preference. If you prefer a concealed valley lining and want your roof to blend together, choose the closed valley. If you like exposed metal, especially if you use copper, you may want to pick open. As for cost, closed cut valleys are the way to go. Especially if you have a significant number of valleys, eliminating the metal lining will reduce the cost of materials. This reduces the overall cost for the project. If you are looking for a valley that will last, there are differing opinions. Closed valleys, if they are not constructed properly, will channel water under the shingles. Open valleys may be susceptible to water backup if the cut-off shingles are not properly trimmed, potentially causing roof leaks. However, it is said that provided the rest of the roofing shingles were properly installed and are performing properly, open valleys will perform better over time than closed valleys. Always know your options when replacing your roof. When considering the valley, take the time to think through the possibilities for getting the appearance and functionality you want in a roof system. At Titan’s Roofing, our roofing and vinyl siding specialists continually provide the best installations and repairs that the industry has to offer. Notably, we can install low-risk, minimal maintenance roofing. Let us carry the weight!